The Old Union Depot, built between 1891-93 was a beautiful example of Romanesque Revival architecture only to be replace by a rather non-descript, severed cube. Crowley's was a direct competitor to Hudson's Department Store which sat kitty-corner to each other. 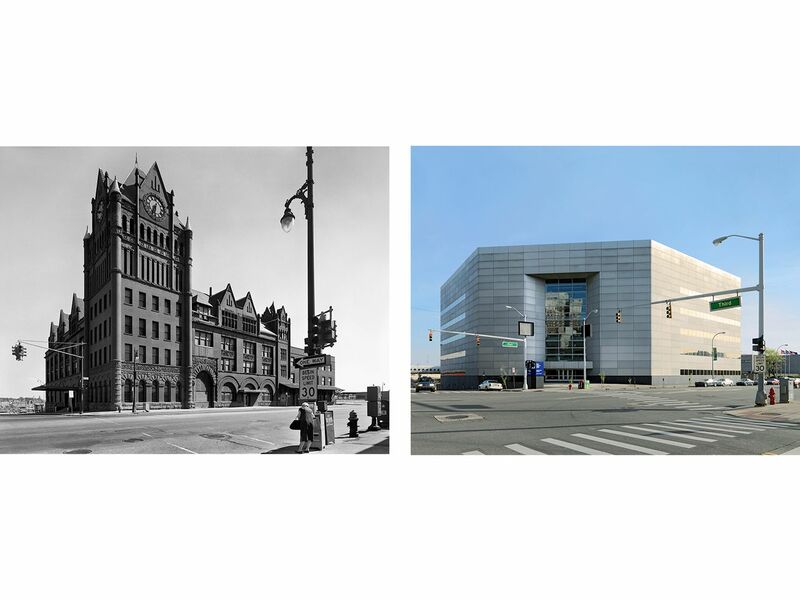 It was replaced by a parking structure that serviced the new Compuware building. Hudson's was Detroit's flagship department store for over a century, but after weak sales figures and a transfer of ownership to the retail giant Target, the building was demolished in 1998 to much television coverage and protests. Today the property still sits vacant waiting for redevelopment. 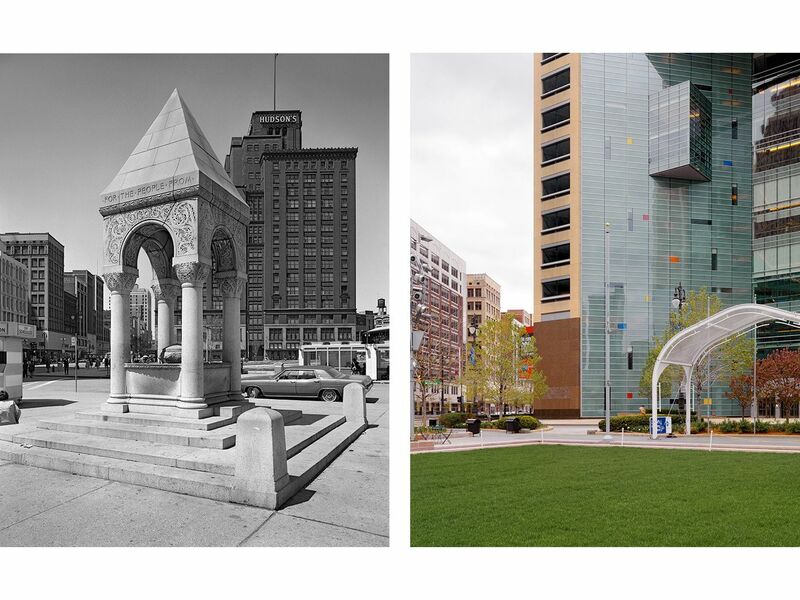 Removed for the restoration and redevelopment of Campus Martius, The Bagley Memorial, designed by noted architect H.H. Richardson, was relocated around the corner and now sits on the east end of Cadillac Square at Bates St. 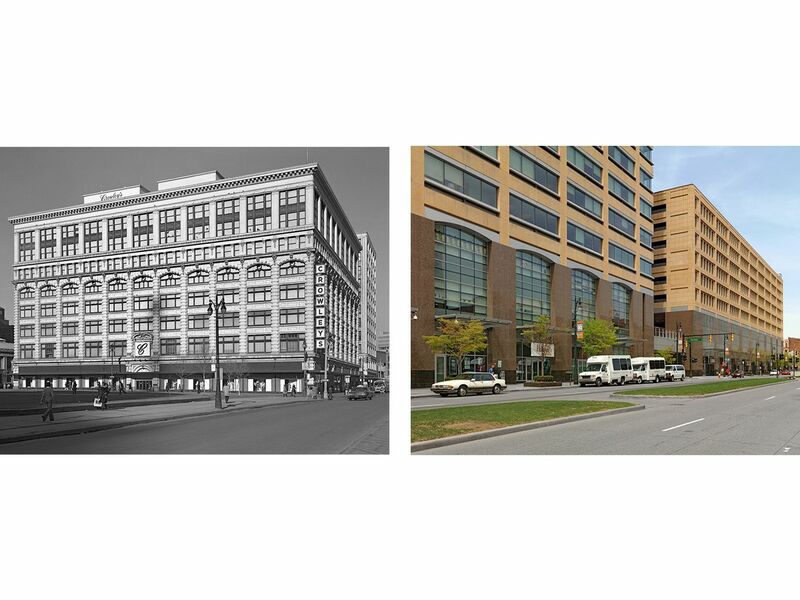 The beautiful Parker Building (B. Seigel's) lost the battle to another parking garage. 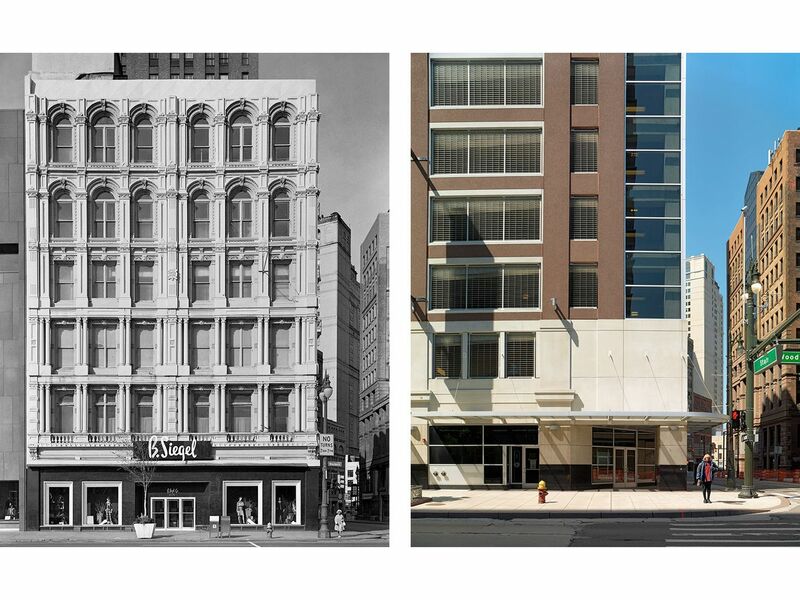 It was the last standing cast-iron facade building in Detroit. 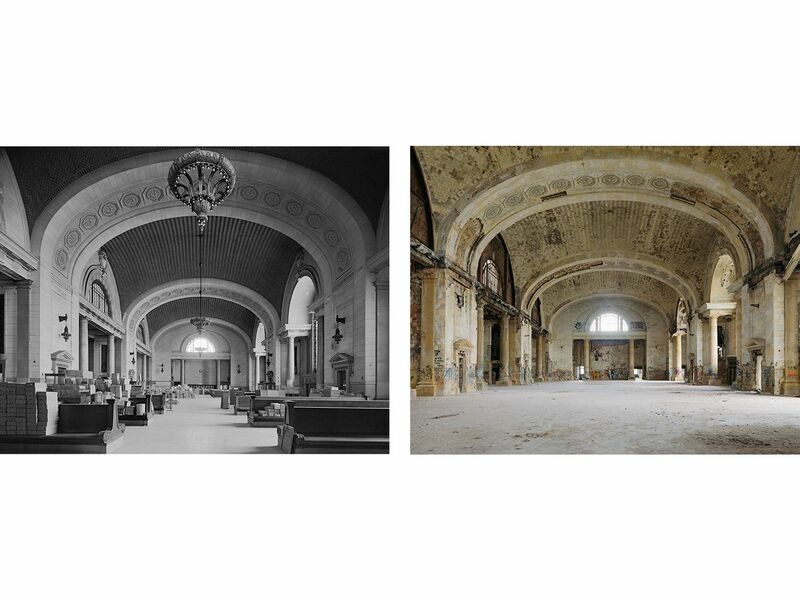 Already being used for storage in 1973, the Geat Hall became a popular destination spot for raves, graffetti artists, and European tourists curious to see one of Detroit's most iconic symbols of urban decay. This concourse, located underground below the main track lines, is shuttered in complete darkness. My good friend Keith Emmerich painted the scene with an LED flashlight while I made the exposure. The Vanity Ballroom was one of the main venues in Detroit that highlighted such Big Band luminaries as Benny Goodman, Duke Ellington, and Tommy Dorsey. When I photographed it in 1973 it had already lost much of its appeal, booking events only occasionally. Thousands of buildings have been raised over the years leaving much of Detroit feeling more like a rural prairie town than a major metropolitan city. 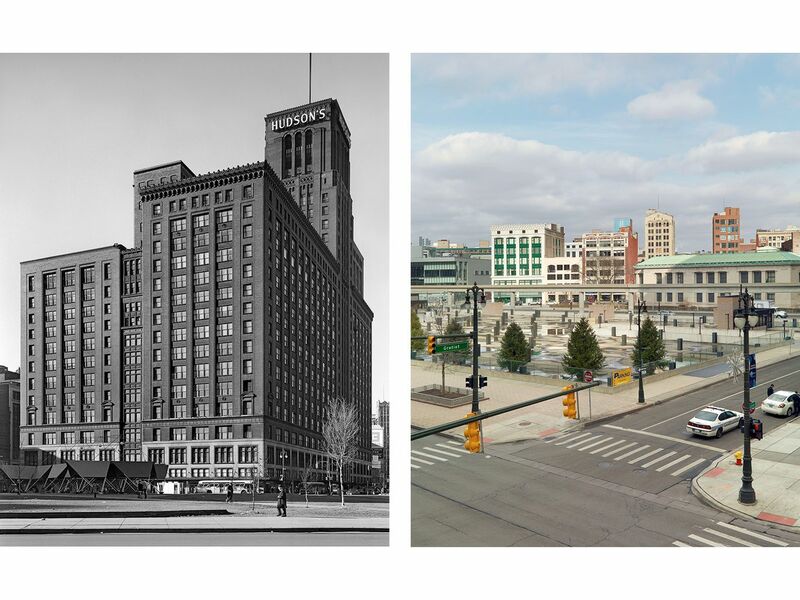 The Farwell Buidling was without question one of Detroit's most prized architectural jewels. Adorned with Tiffany domed lampshades in the main foyer (which were stolen) and irridescent moasic glass tiles throughout its eight floors, it was one of Tiffany's best architectural examples, equal to the Chicago Cultural Center building on Michigan Avenue in Chicago, Illinois.Due to its historical significance, the state forced back posession of the building and purchased it back from the owner who had left it rotting for 25 years. Plans are to rehab the building as best they can to its original condition. The recently built American Axle Corporation plant now sits idle where once a local coal supplier, among other small retail shops, provided fuel and services for neighboring homes. The corporate offices closed the plant and moved its operations to Mexico in 2009 laying off over a thousand Detroit workers in the process. Whole neighborhoods vanished when PepsiCo built a new botteling distribution plant. This particular house which had historical significance was one of the oldest brick homes in the area, built around 1860. Nice trucks. One of the oldest houses in Detroit, Circa 1860. The interior hasn't faired so well having gone through a less that sympathic 80's style post-modern redo. Really atrocious. Demolished in 1991, the Chene house was one of the last remaining Federal Style houses built in Detroit with a significant historical provenance. Built in 1850's, it lost its battle to an IHOP owned by the pop signing star Anita Baker. Currently the site of Crain's Communications. Today the sidewalks have been widened and the street narrowed.